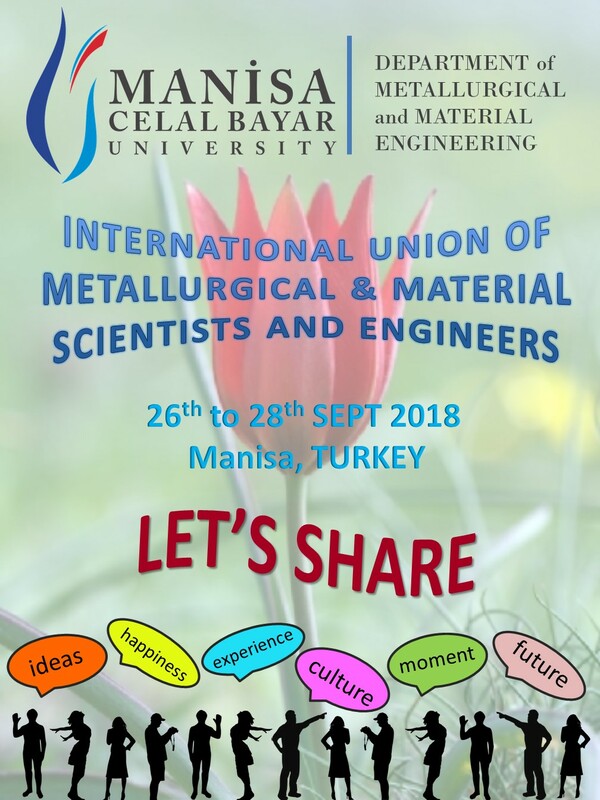 We are so glad to organise the Staff Week which is named “International Union of Metallurgical & Materials Scientists and Engineers” in our university. This organisation will take on the 26th-28th September, 2018 in Manisa City / TURKEY. Thanks to this international staff week, our participants will be able to learn more about Manisa Celal Bayar University, which has more than 55,000 students, diverse programs, a great and green campus and a wonderful location (30 minutes distance by bus to İzmir). The aim of this event is to enable to form stronger networks with our already existing international partners, creating a chance for relationships and better cooperation for students and staff mobility. We will be so happy to see you among us in our activity which we have set out with the slogan of "Let’s share". With regard to this, we would like to meet and share ideas, happiness, experiences, cultures, moments and future. We invite you to discover traditional Turkish life style, authentic towns and museums. We want to introduce the industry as well as the natural beauties of the geography that we live in to you. In this context, technical visits to companies in Aegean Region will be organized according to the study subjects of the invited guests. Application is possible from now on until 31 August, 2018. This organisation is limited to 20 participants, from any fields of Metallurgical and Materials Science. Please fill the application form in below and scan-send us an e-mail about your interest in participation to the following address (mcbu.mme.staffweek@gmail.com). Each potential participant will receive a confirmation e-mail from us. Please note that the application deadline is August, 2018! We would very much appreciate if you share this information with potential participants.